The earliest clockmaker in this family group was Edmund Bullock who is first mentioned at Ellesmere in 1708, when his first child, Sarah, was baptised there on the 8th of July to him and his wife, also named Sarah. Other children were baptised to them there later, being: 29th July 1709 Mary; 6th July 1711 Anne; 6th June 1713 Thomas; 6th January 1715/16 Jeremiah; 14th March 1716/17 Martha; 9th February 1718/19 Hannah and Richard, being twins; 5th January 1722/23 Jeremiah; 29th December 1725 John (died in infancy). On some occasions his name is written incorrectly into the parish registers as Edward, and it seems that the names Edward and Edmund were sometimes used indiscriminately at that period. Anyway it is pretty clear from the church registers who he was. We can guess that he was born about 1688 or a little earlier. His origins are unknown but there was an Edmund Bullock, son of Edmund Bullock senior and his wife, Lucy, baptised at Wrockwardine, Shropshire, in 1686, which might be him. In 1712 he made a new church clock for Chirk at a cost of five pounds. Edmund worked on various local church clocks, including that of Meifod in 1734 , and that of Ellesmere itself from 1725 until his death in 1734, for which churchyard he also made a sundial signed 'Edm. Bullock Ellesmere fecit 1726'. A number of longcase clocks are known by Edmund, ranging from simple thirty-hour examples to eight-day ones, some of them of very high quality. At least one bracket clock is also known by him. There is often something out of the ordinary about Edmund's clocks, such as an eight-day single-handed clock, of which very few were made anywhere - though at least one is known by his son, Richard. One interesting aspect is that he numbered many of them with a serial number on the dial front for all to see. About this time a number of clockmakers took up this habit. There are clocks by Edmund, apparently very early ones, which are not numbered, so perhaps he did not hit upon this idea immediately. Those I have come across which are numbered are: 93, 133, 194, 208, 246, 301, 303, 417, 424, 717. Some of his clocks are signed without a first name as just "Bullock Ellesmere", for instance number 208 and number 424. Perhaps he felt he did not need to put a first name as there was only one Bullock making clocks at Ellesmere at that time. An interesting aspect strikes me about his numbering, in that it is often engraved above the placename, as if added as a last-minute afterthought - and it probably was. We believe most clockmakers could not do their own engraving, hence the great variety of engraving styles in one man's work. If he had to send a chapter ring away to the engraver to be engraved, or order a pre-engraved chapter ring with his name ready lettered, how could he know in advance what serial number it was to carry? So my question is: did he pre-order a number of chapter rings (or their engraving) before he sold the clock(s) and then add the serial number at the last minute at the point of sale? It seems quite possible. Oddly enough his son, Richard, usually had the serial number positioned after the name. Does that mean Richard could engrave and Edmund could not? We may never know. Twelve-inch dial of Richard Bullock's eight-day clock numbered 161 dating from the late 1740s. The Four Season spandrels begin to appear about this time. Original hands. Click for closer view. Edmund took three apprentices. In 1712 he took Thomas Studley, the son of Thomas Studley senior of Ellesmere, for seven years at a premium of £8.00. - he went on to work at Shrewsbury after 1721. In 1722 he took George Lomax, son of George Lomax senior of Ellesmere, for seven years at a premium of £20. - he went on to work at Brecon from about 1730 till his death in 1781. In 1730 John Walker, son of Edward Walker of Oswestry, for seven years at £21.00. - John Walker is a name too common to trace. It is a measure of his increasing rating as a clockmaker that he could afford to charge increasingly high premiums when many a clockmaker (including his son, Richard Bullock, later) would take a boy on for half that figure. "Five clock cases at £5.17s. 5d." This works out at only £1.3shillings each (£1.15p). "Six working vices £2.00." Six vices could imply he had at least two men working apart from himself, giving them two vices each. "Brass Heads Paterns", "Brass & Led &Wooden paterns", "a Cole Trough & Sand Trough", "brass patterns" - refer to spandrels, which he clearly cast for himself rather than bought in from suppliers, as he has the patterns for making the mould impressions. "bowel string 4s 0d" (£0.20p.) would be what we call catgut and were made from the intestines of sheep (not cats) for hanging the clock weights. "new clocks" £18." Could be six longcase clocks, implying that he made some up front ahead of orders. "two sundials" 2s 0d. (10p) seem very cheap. "a Chester Draws" means a chest of drawers. "a Corner Cobert" is a corner cupboard. The total came to £138. 8s. 2d. (£138.41p). Oddly enough one of those who took the inventory was a William Bullock. Who he was we do not know, but presumably a relative of Edmund's, perhaps a brother. The Edmund baptised at Wrockwardine in 1686 had a younger brother named William baptised there in 1692. Was it perhaps him? Douglas Elliott records a William Bullock, clockmaker, working at Wootton, Oswestry, who died there in 1742. Perhaps the same William. The case of Richard Bullock's clock number 161 is in elm, a wood which seldom survives from this period. The pediment represents a primitive swan-neck profile. Click for closer view. Edmund had two sons who followed him in the trade. Richard was his main successor, and, being born in 1719, was only fifteen years old when his father died in July 1734. Presumably he had to knuckle down right away to keep the family finances coming in. The younger son, Jeremiah, was only eleven when his father died, and he too took up the clockmaking trade, presumably by the age of sixteen or so, about 1739, by which time his older brother, Richard, had already been running the business for a good five years. Jeremiah was married at the mature age of forty eight on the 23rd August 1771 to Ann Jackson, and had a child named Edward born in 1772. Jeremiah died in 1780 at the age of fifty seven. It seems as if Jeremiah worked for his older brother throughout. At least we can assume this to have been so as no clocks have been recorded signed in his own name. Like his father Richard Bullock was an interesting clock maker. He made a variety of clocks from the simple to the more complex, but he knew what he was doing and often put his own idiosyncratic stamp to his work. Richard continued his father's idea of numbering his clocks, probably all of them, but with his own set of numbers, not simply carrying on the numerical sequence where his father finished. Clocks I know by him are: 26, 27, 56, 72 (8day 1 hand), 93, 132, 146, 161, 163, 207, 220, 292, 384 (dated 1766), 410, 424, 552, 559, 569, 589. A sundial is also known by him dated 1742. The sort of individuality displayed in the work of both Edmund and Richard Bullock makes them stand out from the crowd as clockmakers. Richard's clock number 161 pictured here is just such an example of the kind of clock sometimes thought of as made by a country bumpkin. But here was a man not slavishly following the established pattern, as an apprentice-trained, London maker would, but a man who thought for himself. Such makers often devised their own systems, as here with Richard Bullock's own personal system for triggering a rack-repeating clock. The hood of clock 161 in close-up shows the half-baluster pillars attached to the door, a carryover in style from earlier times. Click for closer view. 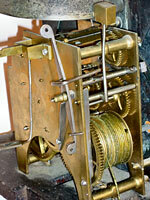 There is a lot of misunderstanding about repeating on a longcase clock. It was a function often made available on many north-country clocks but much less often in the south, and consequently many clock books written by southerners are either unaware of its existence or regard it as an extreme rarity. What was it for? Well, it was to enable the last hour to be re-struck at will by pulling on a cord. That cord could hang inside the clock case, outside the clock case through a hole at one side (usually the side of the hood), or outside the clock case by passing through a hole in a moulding at the front below the hood. Sometimes the cord could be taken upwards (out of the hood side or hood top) through the ceiling into a bedroom, and in that latter case a pulley of some sort was usually needed to avoid the cord fouling and getting stuck. If a repeater cord gets stuck holding the clock in what might seem to be a permanent repeating position, it will not keep on repeating but will prevent the clock from striking. How do I know that? Because I have had to attend clocks in houses where, unknown to his parents, some little Jimmy has been swinging on the cord to impress his small friends, bent the spring and jammed the strikework. The purpose of a repeater was so that someone half-wakening, perhaps during the night or on a dark morning in winter, and unaware of the time, could pull the repeater cord at the bedside and instantly learn the time to the nearest hour past. It fulfils exactly the same function on a longcase clock as the repeater cord on a table clock, but we are perhaps more used to the fact that this could sit by the bedside at night - in those wealthier homes which could afford a bracket clock. In daytime it might be used to summon the family to a meal, dinner gong fashion, by repeating the hour till those called finally heard it - dinner in a grand house, or afternoon tea. I forget which Jane Austen novel tells of the maid hurrying down the path to the mistress, who was showing guests around the garden, to report that the hour had struck for afternoon tea but nobody had heard it, and what should she do. She was told not to be so rude as to interrupt them but to go back at once and keep repeating the hour on the clock till they did hear it. So the repeater was there for a purpose, even in daytime. I remember once reading a scathing piece written by someone clearly inexperienced with longcase repeating, who denied its purpose and stated that any rack striking clock could be made into a "so-called repeater" by simply tying a piece of string onto the rack hook and tugging at it when desired. Well, that may be true but it is nonsense. A longcase with repeating facility usually has a purpose-made blade spring with a hole at its tip for a cord, the spring being positioned between two pins on the lifting piece to return it to its position after being tripped, in other words to avoid jamming in the 'on' position. That blade spring is there for this purpose and no other. Many clocks that once had this facility have later had the blade-spring removed by restorers unaware of its function, but even then it is usually obvious from an empty screw-and-pin hole where it was once fitted. The repeat trigger in closeup, with the sturdy return spring positioned below it. Holes in either end are to take a repeater cord. Click for closer view. In the example pictured here Richard Bullock could have fitted a normal trigger bladespring, with which he must have been very familiar. But he opted instead to devise his own form of repeating system, with a trigger arm and also a separate and very substantial independent return spring. The trigger arm has a hole at the top to take a cord, as we would expect. But it also has a lower extension arm and that too has a hole in it to take a cord. What for? Well, the upper arm is designed to take a cord out of the left of the hood, where a purpose-fitted wooden pulley receives it and guides it, either down towards the floor or upwards towards the bedroom, whichever is desired. But Richard was thinking ahead - what if for some reason the owner wanted to repeat the clock from the right-hand side? Then a cord could be attached to the lower trigger arm instead, and the return spring would still function. So his system offered either-side repeating. The trouble Richard Bullock took to design and construct this either-side repeating system is symptomatic of the clocks made by Richard and his father before him in that they often had something special about them, something extra, over and beyond what was expected. So much so that when you come across a Bullock clock you begin to expect to see some interesting feature of style or design, which they delighted in. If it does not strike you at once from the clock's appearance, it is probably hidden away inside the mechanics. This view of the left side of the hood shows the wooden pulley designed to take a repeater cord from inside the hood, either upwards through the ceiling to the bedroom, or downwards for side-pulling. Click for closer view. Richard took on four apprentices. On the 25th March 1740 he took Bartholomew Basnet, son of John Basnet, for seven years at £10.20s.0d. He was not heard of again. On the 11th May 1758 he took Samuel Phillips for seven years at £10.10s.0d. Samuel Phillips worked at Oswestry in the 1770s and 1780s. On the 19th April 1763 he took Thomas Farrington for seven years at £10. Thomas Farrington later worked at Bristol, Somerset. On the 7th April 1767 he took Edward Davies for seven years at £10. Richard Bullock seems to have remained a bachelor. At least I have found no evidence he had a wife or children. Clocks are known by Bullock and Davies, which was presumably a partnership between Richard and his former apprentice, Edward Davies. Edward Davies worked on at Ellesmere, quite possibly for Richard Bullock, till his death in October 1798 aged 44, just short of a year later than his master. Douglas Elliott quotes from the church registers: "3 November 1797 Richard Bullock of Ellesmere, clockmaker, aged 78, buried." So ended a line of excellent clockmakers. A fuller version of this article was published in the Horological Journal.